More than 40 people gathered at the Two Harbors Community Center May 2 for a public meeting planned by the Friends of the Band Shell Park. 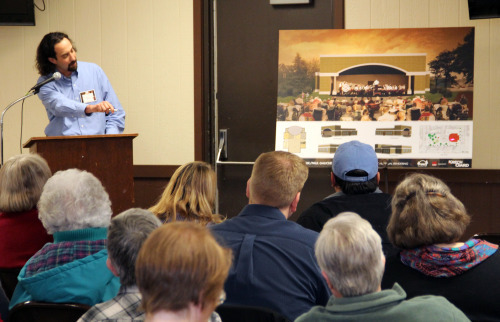 More than 40 people gathered at the Two Harbors Community Center May 2 for a public meeting planned by the Friends of the Band Shell Park. In addition to members of the FBSP committee, those in attendance included five of seven city councilors; Kane Tewes of Krech Ojard and Associates, a Duluth-based engineering and architecture firm; and Okey Ukaga, executive director of Northeast Minnesota Sustainable Development Partnership. NMSDP is a program of the University of Minnesota that connects communities with resources for special projects. Ukaga has been offering guidance to FBSP on its ambitious plans to build the Paul Gauche Performing Arts Center.The proposed center, designed by Tewes, would replace the 77-year-old band shell in Thomas Owens Park, and include a new band shell, indoor rehearsal space and storage areas for the equipment, instruments, uniforms and musical archives of the Two Harbors City Band. The facility would be owned and maintained by the city and used by other arts organizations or for community events, but the FBSP says the facility would be first and foremost, a home for the band. The building’s design has not been finalized, as funding has not yet been secured. The price tag for the building is estimated at $3 million, a figure that several FBSP committee members acknowledged is a significant sum. Diane Dinndorf Friebe said she has been researching potential sources of grant funding and has a list of 60 foundations that may be amenable to a proposal. She emphasized the importance of community support, however, in garnering outside financial backing. “Once you get some money, then you can get more money,” she said. Ukaga said that Finland was able to achieve its goal of a new community center by taking its planning one step at a time. Although the construction of the Clair Nelson Center was a major accomplishment for the Finland community and it has been widely praised by many who live there, residents recently opted to increase property taxes to help pay down the center’s remaining debt. Asked if Two Harbors residents might face the same dilemma, committee member John Gregor said that FBSP plans to continue seeking funding sources for the Paul Gauche Performance Center over the long haul. “We hope to fund this entirely without tax dollars,” Anderson said. Mayor Randy Bolen congratulated the FBSP on its ongoing efforts, but stopped short of making a definitive promise of support. He said that the council attended the meeting to hear what the community had to say and get more information about FBSP’s proposal. At least two city councilors, however, readily offered their backing. Councilor Robin Glaser, whose husband is on the FBSP committee, was enthusiastic about the proposed facility. “When I looked at all this, I was pretty darned excited and I will support this project 110 percent,” she said. Other members of the audience were not so easily persuaded. Linda Melcher of Arts on Superior questioned whether other non-profit arts organizations could use the facility for storage, since the city (and taxpayers) would ultimately own and maintain the building. “The band would be the anchor tenant. It will not be a permanent storage space for other tenants,” said Sandvik. Despite the lack of enthusiasm for Melcher’s proposal, the committee did not immediately rule out Fran Kaliher’s proposal that the Two Harbors community radio station be housed in the building. Melcher also asked if the choice to build the center would be presented to the community in the form of a referendum. “I think the governing body should make the decision,” said Sandvik, referring to the city council. After the meeting Mayor Bolen was asked if the new Paul Gauche Performing Arts Center was a slam-dunk with the council.